<li class="comment"><a title="" href="<?php the_permalink() ?>#comments">' rel='nofollow'><!--?php if ('open' == $pos<br ?-->推奨: single.php 内にテキストドメインに関する問題があります。 テキストドメインが含まれていません! <li class="comment"><a title="" href="<?php the_permalink() ?>#comments">' rel='nofollow'><!--?php if ('open' == $pos<br ?-->推奨: page.php 内にテキストドメインに関する問題があります。 テキストドメインが含まれていません! <li class="comment"><a title="" href="<?php the_permalink() ?>#comments">' rel='nofollow'><!--?php if ('open' == $pos<br ?-->推奨: footer.php 内にテキストドメインに関する問題があります。 テキストドメインが含まれていません! <li class="template"><a href="http://vicuna.jp/">vicuna CMS</a> - <a title="'<br" href="http://ma38su.org/projects/">推奨: config.php 内にテキストドメインに関する問題があります。 テキストドメインが含まれていません! 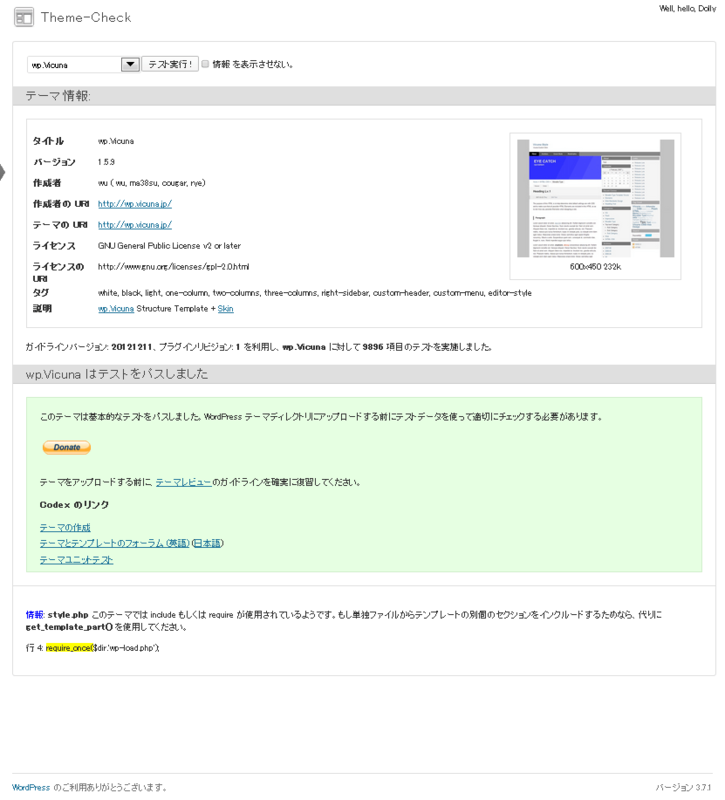 </a><a href="<?php bloginfo(">'><!--?php _e('Home'); ?--></a><!--?php <br ?-->推奨: archive.php 内にテキストドメインに関する問題があります。 テキストドメインが含まれていません! RECOMMENDED: No reference to add_theme_support( 'custom-header', $args ) was found in the theme. It is recommended that the theme implement this functionality if using an image for the header. RECOMMENDED: No reference to add_theme_support( 'custom-background', $args ) was found in the theme. If the theme uses background images or solid colors for the background, then it is recommended that the theme implement this functionality. RECOMMENDED: Screenshot size should be 600x450, to account for HiDPI displays. Any 4:3 image size is acceptable, but 600x450 is preferred. RECOMMENDED: Screenshot dimensions are wrong! Ratio of width to height should be 4:3. RECOMMENDED: Possible variable $wd found in translation function in functions.php. Translation function calls must NOT contain PHP variables. RECOMMENDED: Possible variable $layout_name found in translation function in widgets.php. Translation function calls must NOT contain PHP variables. Copyright © rougebleu All Rights Reserved.